It’s no secret that we at Signature Living are a Liverpool hotel group who like to do things a little differently. First came our unique themed party apartments, followed by three spectacular hotels, all of which were created in landmark Liverpool buildings. Now there’s no need to wait until summer to throw an amazing pool party, as at Signature we’ve got that covered too. 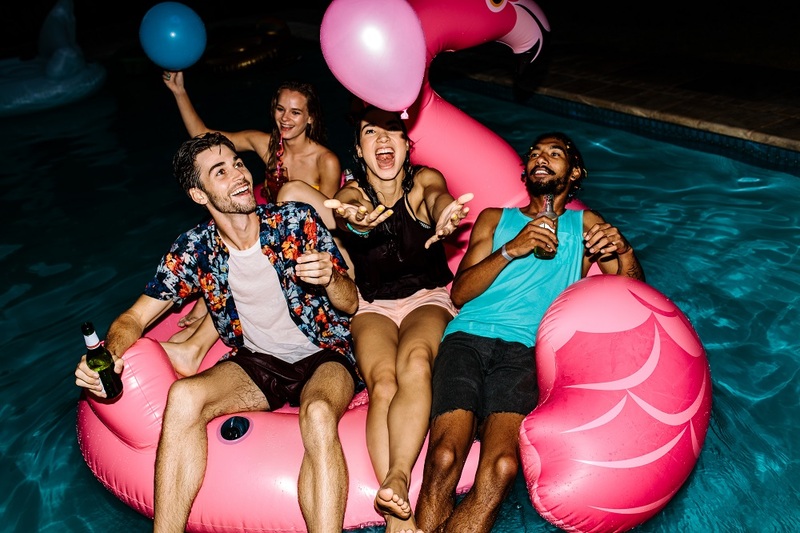 Simply pick out your most glamourous swimwear and get together with your closest friends by booking an epic pool party night in any of our exciting pool party hotel rooms. Our pool party hotel rooms contain some of the most unique indoor pool party facilities, with entirely private access from the comfort of your luxury Liverpool hotel suite. These hotel rooms and apartments are perfect for you and a select group of your closest friends to enjoy a one of a kind parties in the centre of Liverpool. Located in the depths of 30 James Street you’ll find a little-known secret. A hotel room built specifically to host epic pool parties in Liverpool. Created from the original vault rooms of Albion House, Morgan’s Vault has now been transformed into Signature Living’s most prized pool party hotel room. Sleeping up to 20 people in one place, guests can enjoy a fabulous sleep in any of the 10 luxury double beds. 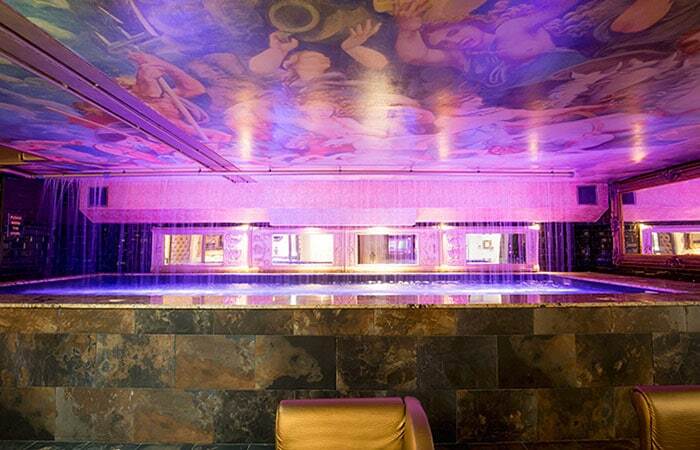 Designed with utter opulence in mind, Morgan’s Vault gives guests the perfect place to rest their head after attending the most exciting pool party in Liverpool. Three double beds are tucked onto an upper deck, accessible by a handy staircase. The rest are spread out around the suite which includes excellent hotel room facilities such as large TV’s, vanity desks and two en suite bathrooms and double whirlpool baths. There are even some original features in this breathtaking hotel room, such as the large safe that once held White Star Line’s most important documents. Today, this unique feature opens to reveal a few party favours, courtesy of Signature Living, to help get your evening fun started. Step through the original heavy steel door that protected more of White Star’s valuables, to enter a one of a kind pool party experience. After descending a secluded spiral staircase you’ll arrive in Morgan’s Spa, where you’ll be greeted by a huge pool party venue and your own private 40-foot hydrotherapy pool. Hire your very own bartender with mad mixology skills to make you indescribable cocktails and of course, no pool party would be complete without great music so, our club quality sound system can help take care of that. At Signature Living, we provide everything you need to enjoy the most epic pool parties in Liverpool. All you need to do is bring your swimsuit and all your closest friends. Should you wish, you can arrange to book the entire lower floor of 30 James Street for your special occasion. 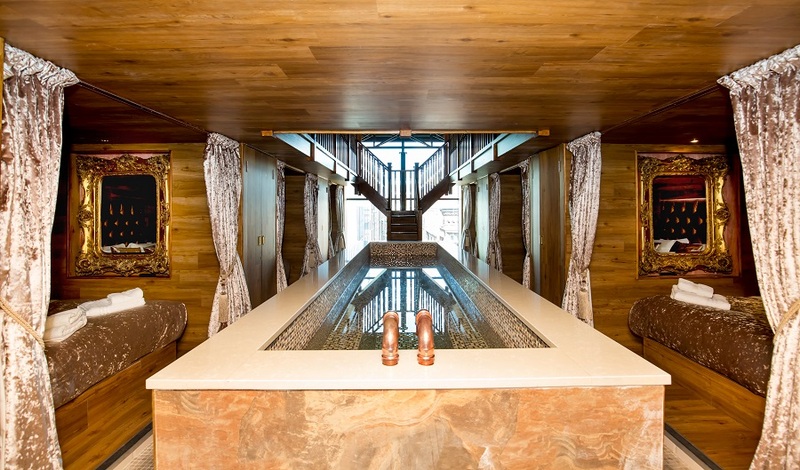 The basement level floor can accommodate a further 28 of your pool party guests in any of the five luxury cabins. 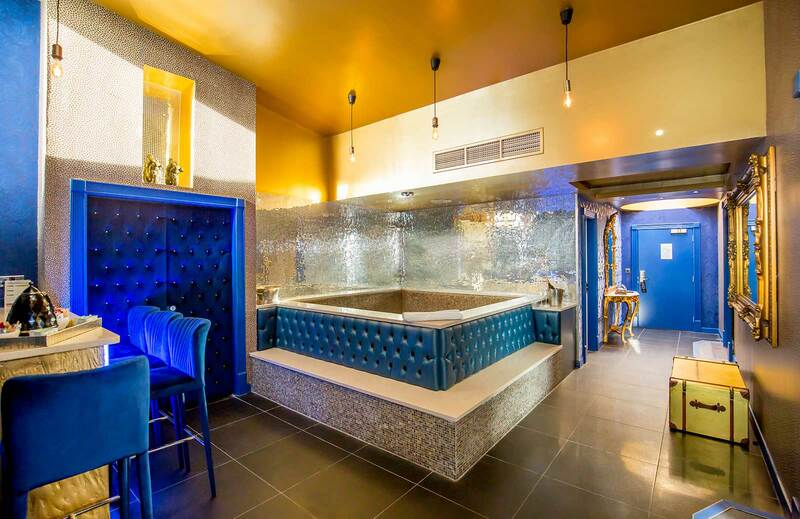 At Morgan’s Vault, you and your friends are guaranteed an unforgettable hotel experience and a splashing good time. Signature Living is proud to be the creators of Liverpool’s only upper floor city centre accommodation with an indoor pool. The Laurent Perrier Pool room can be found on the 4th floor of The Shankly Hotel and is a featured accommodation from Signature Living’s Ultimate Party Apartments. 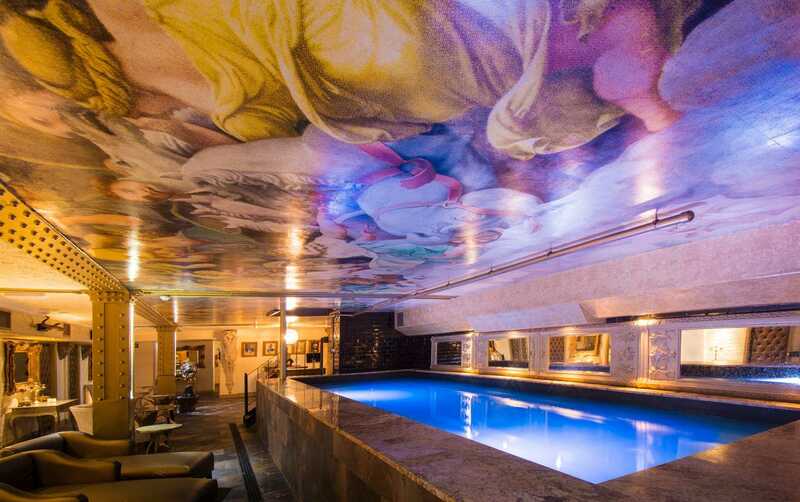 This mind-blowing suite is the ideal place to throw a pool party night in Liverpool for up to 24 guests. Better still it boasts an indulgent 25-foot mosaic pool! All 12 of the comfortable double beds have been set back into their own private cabin, each equipped with their own en suite bathroom and drop down TV. These cabins surround a large open party space spread across two floors and can be hidden from view by heavy crushed velvet curtains. But why would you want to hide away from such an awesome Liverpool pool party experience? With your own private bar and top of the range multimedia sound system, the LP Pool room will soon feel like your own exclusive Liverpool nightclub. There has never been a party like an LP Pool Room party, so, for your next special occasion why not book Liverpool’s most unique pool party hotel room? Just leave the planning to us and we’ll make this the most memorable celebration of all time. In 2017, we welcomed the newest member of the flock into our family, the stunning Flamingo Suite. 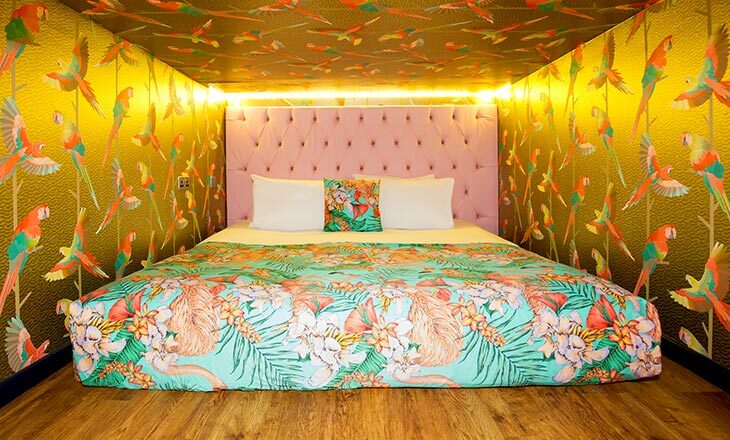 Bringing a taste of tropical paradise to the streets of Liverpool, The Flamingo Suite is a fabulous addition to our repertoire of incredible pool party hotel rooms. 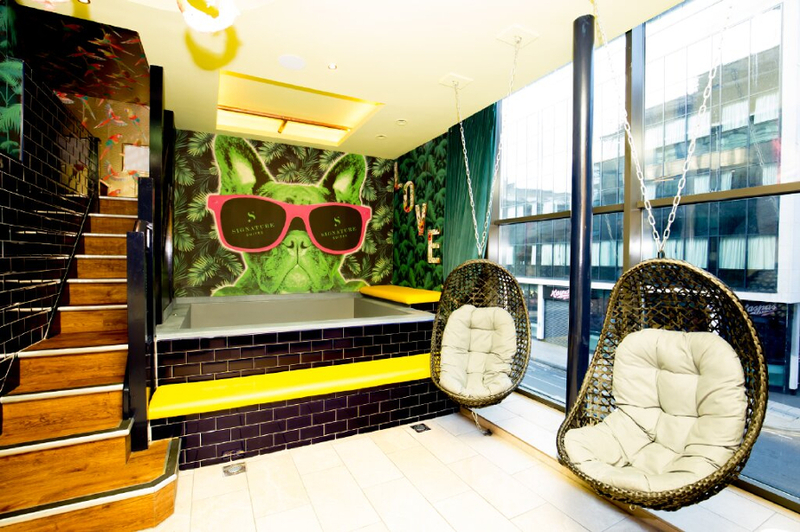 Featuring plush double bunk beds that can sleep up to 12 people, a secret snug room in the rafters and a truly beautiful décor that will blow your mind, The Flamingo Suite is the perfect place to host a hotel pool party in Liverpool. Of course, the best part of The Flamingo Suite is the breath-taking 10-berth bath, complete with an Instagram-worthy French Bulldog motif to make sure social your media posts really pop. Grab some fizz on arrival, get the bubbles on the go and dive into an experience like no other, by hosting your very own Liverpool pool party in The Flamingo Suite. 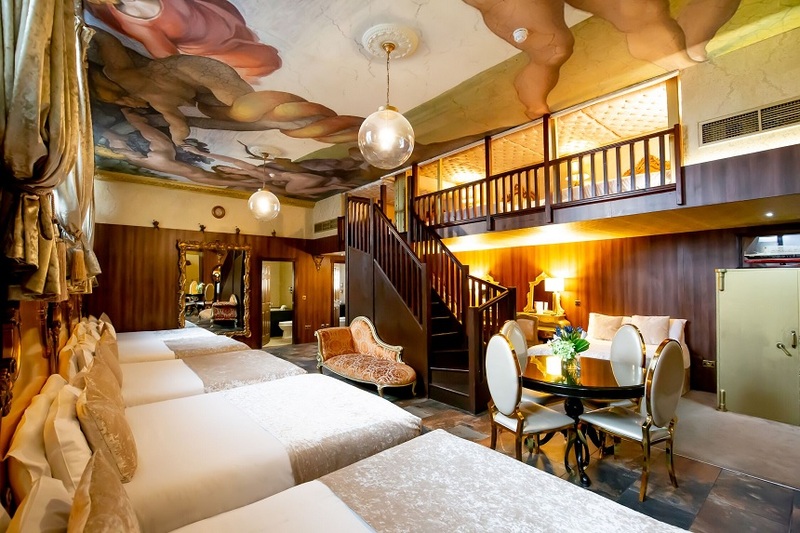 Arthouse Hotel on Seel Street is known for its striking suites and movie-themed hotel rooms. The latest Skyline Suites are the sweetest cherries on top of a very tasty cake. Everything from the dreamy, deep blue decor, to glistening poolside tiles, provide the perfect backdrop for sophisticated selfies and candid snaps. The huge jacuzzi bath is the centrepiece of the suites, offering the opportunity to have a soak and a splash with those you love most. All this, plus an entirely private terrace overlooking the stunning city skyline and bustling Liverpool nightlife below, adds an extra touch of cosmopolitan party chic. 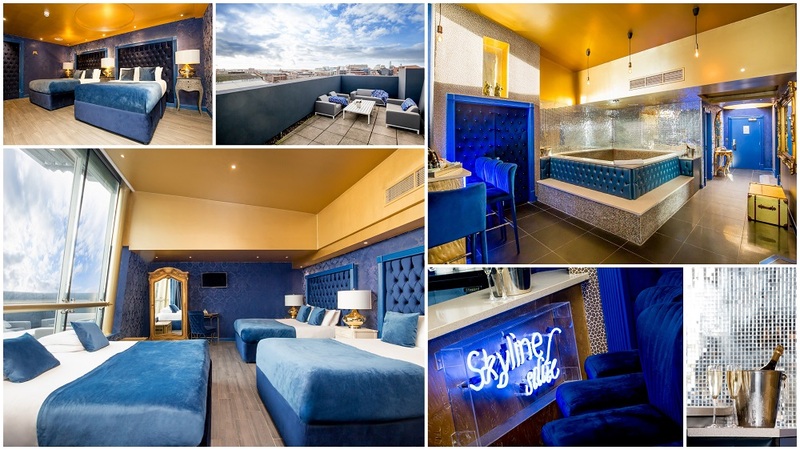 The Skyline Suites are the perfect spot to begin, spend and end a splashing pool party night in Liverpool. Like what you see? If so let’s see if you’ve chosen the perfect pool party hotel room for your next big celebration. Call and book today on 0151 236 0166 and speak with one of our helpful reservations team. Alternatively for more information on how to arrange your Signature Living pool party email info@signatureliving.co.uk and we’ll be happy to help. 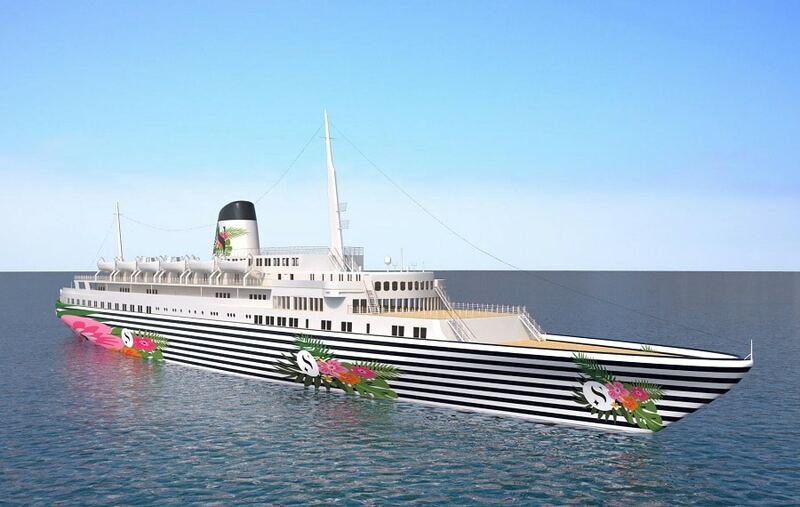 Or if you’d really like to push the boat out, keep your eyes and ears out for our exciting new adventure; The Funchal. We’ll be taking Signature Living’s wet and wild concept off dry land out onto the seas in search of sunshine and good times. You could be one of the first to jump on board this one of a kind floating beach club, docked off the vibrant party island, Ibiza.